If you live in a MODERATE or EXTREME risk area, and use natural gas. You can help protect your home and family from fires, explosions and gas leaks caused by earthquake damage by installing the NORTHRIDGE valve! Quakes as large as 7.6 possible from smaller faults directly under city. Researchers have calculated a 20 to 70 percent probability that southern California will be hit by a large earthquake in the next 30 years. The forecast is based on the frequency of past events. The geologists have determined the probability that the lull will end in the next 30 years. 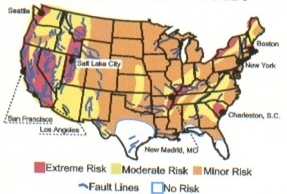 Depending on the model, the next rupture - which will likely affect a substantial portion of the fault line - may be one great earthquake (magnitude greater than 8) or a series of large earthquakes (magnitude 6 or greater). There are at least two faults running into the city limits that may be capable of a large, damaging earthquake of magnitude 7 or more, larger than the Northridge earthquake in January 1994. There are many more apparently smaller faults. Reno could have earthquakes just as large or larger than the Northridge or Loma Prieta earthquakes, but less than half as often. Just within 25 miles of Reno, history records 16 serious (M>=5.5), potentially-damaging earthquakes since 1869, or more than one every ten years.